Defense Presents Full Video Of Tsarnaev Giving Camera The Middle Finger : The Two-Way The defense was trying to blunt the prosecution's claim that Dzhokhar Tsarnaev had one more message to send. During the second day of the penalty phase of the Boston Marathon bombing trial, a defense attorney for Dzhokhar Tsarnaev presented full video of the convicted bomber giving a holding cell camera the finger. As we reported, on Tuesday the prosecution presented a still from that video that showed Tsarnaev looking angry with his middle finger pointed toward the camera. The prosecutor told jurors, who are considering whether Tsarnaev should be put to death for his crime, that the picture showed the "unrepentant killer he is." As NPR's Tovia Smith reports, the full video leaves a "strikingly different impression." "Miriam Conrad, a defense lawyer, said as she cross-examined a government witness that the surveillance camera had a shiny reflective cover, like a mirror. 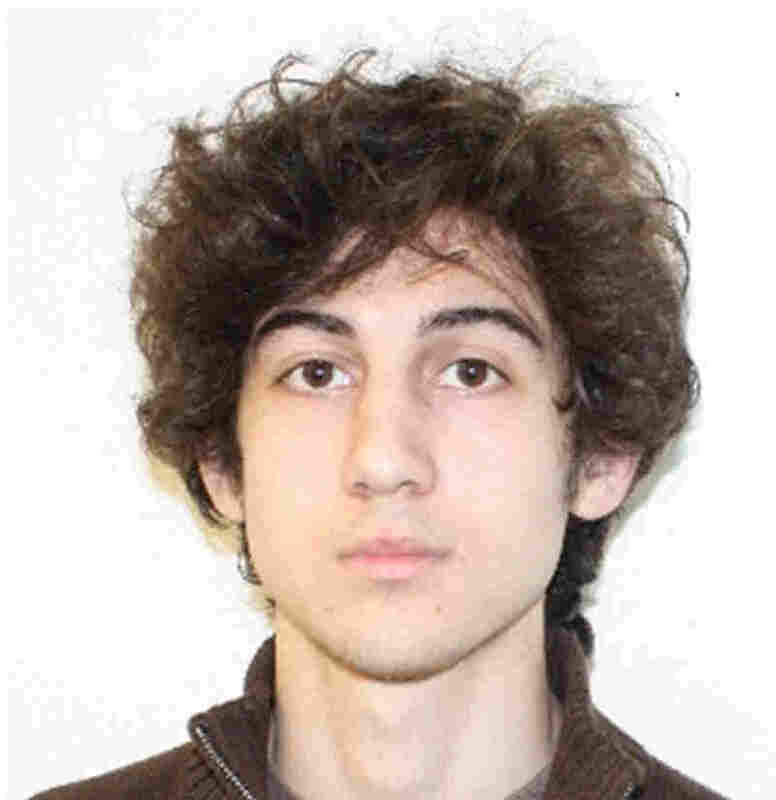 "The video showed that shortly after he entered a holding cell, Mr. Tsarnaev looked at the camera and began primping his long, floppy hair. He stood on a bench and looked more closely into the camera, again as if into a mirror, and continued to fluff up his hair. "Then in very quick movements, he flashed a backward, two-fingered sign that Ms. Conrad called a 'V sign,' and then the middle finger. The judge did not allow Ms. Conrad to characterize the fleeting gestures. But the video seemed to cast some doubt on the prosecution's contention the day before that Mr. Tsarnaev had 'one more message to send.'" Tovia tells our Newscast unit that aside from the video, jurors also got a huge dose of grief today, as more victims of bombing testified about their pain and loss. "Victims' relatives started out with fond tales of loved ones — slain police officer Sean Collier running around as a kid, making siren noises, because he always wanted to be a police man. Lingzi Lu who loved sweets and animals, eating whipped cream by the fingerful and calling herself a sister to her pets. "Then jurors were brought to tears hearing how their families were devastated by their sudden loss and their ongoing struggle to recover. They heard gut-wrenching testimony from survivors too, like a 30-something dancer who lost a leg, and her husband — also injured — who is currently in a mental hospital. "Prosecutors continue on Thursday, then defense attorneys will begin to try to explain why Tsarnaev's crimes do not deserve the death penalty."